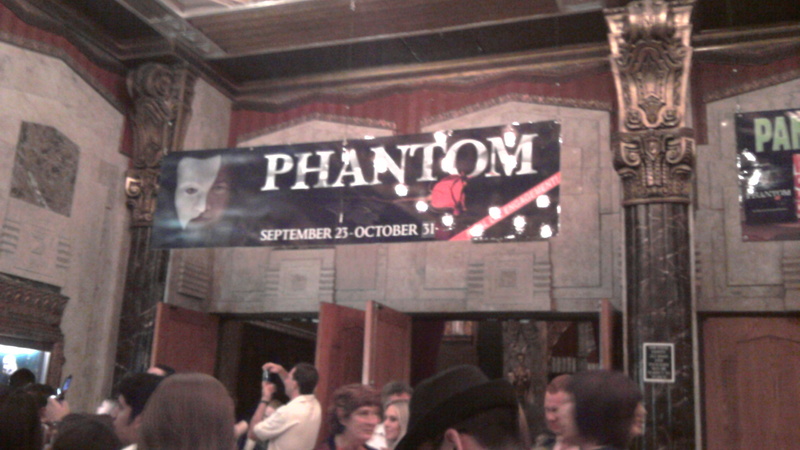 So I recently got to see Phantom of the Opera at the Pantages in its (at least the current tour’s) final run in Los Angeles. I have to confess, it was my third time watching it, being nearly six years since the last time I saw it at the Ahmanson. (I broke my Phantom virginity in New York during my junior year of high school which was spectacular, even in the back rows of the bleacher). Some may state that it’s a bit abnormal sometimes for guys to be in love with such a romantic, melodramatic musical yet I won’t shy away from saying that really, it is one of my favorites. Some of the most lavish production values to date, a sweeping and unforgettable musical score, and a smart and simple story that gets its point across. So I thought since I got to enjoyed my time with the Phantom one “last” time in Los Angeles (until at least it returns again in a few years with a new tour or perhaps the sequel finally hits US shore), I’d go a bit more in-depth with what I liked/disliked about this particular showing and some of my thoughts on the general show itself. The Hollywood Pantages really is a beautiful place to host such a spectacle-driven musical. Fitting right in with the fancy set designs and crazy set changes that happen constantly, the dark and gold borders of the stage and the gold pillars that lead up to the stage are more than exquisite. The production itself includes pretty much all of the normal set pieces and all and even though the show is showing some age, the special effects are still some of the best in the industry. There was a hitch at one point with the microphones (although how they limit that with all the performers running around is a feat unto itself) but otherwise, it was technical problems-free. The performances range from a bit stilted and odd to wonderful. Meg’s performance, for instance, came off as one of the weaker ones, even though her scenes are few while Christine herself, at this particular performance, had a great and beautiful vocal range and operatic voice yet her vibratos and opera voice sometimes were too much and made lyrics hard to hear. The best of the best was the Phantom himself. He had a powerful presence with his voice yet his shrills and higher pitches were simply marvelous as well. True, some may say it’s been done before, yet there is no reason to discard another magnificent interpretation here. -The musical was a lot more melodramatic than I remember it being. Perhaps it has to do with age and experience but undeniably, some scenes such as the Phantom, during the Masquerade sequence, slowly walking down the stairs with the orchestra punctuating each step, seemed a bit more comical than usual. Perhaps it has to do with the modern time as well. However, the interesting point here is that it didn’t detract from the always-intriguing count-and-counterpoint romance story between Christine and the Phantom. I still find that their romance, their separation, and their re-connection the most fascinating of the story. I still tear up at the final scene with the Phantom because the musical smartly makes the audience member have to rethink the points of the story and whether to forgive or condemn him in the end. -The orchestra always are the unsung heroes. It was funny to notice, though, especially when the Phantom and Christine enter the sewers, that the mist/fog enters the orchestra pit and noticing the conductor furiously conducting to make his baton seen. It must be quite a section for them all. Large props to them here for sounding spectacular and although I do not know where the small changes to the music occurred (in terms of which production it changed) but I love the flourishes, the heavier brass, and the lush strings in this production. -Phantom lives on for me because the core story is simple to understand yet complicated in terms of characterizations. Pity, remorse, regret, lust, love, compassion, hatred, anger, fear, passion, apathy, jealousy…are just a few of the emotions displayed in the 2 hours and 30 minutes running time. That’s quite a feat for a production that is highly filled with production gimmicks and watching it again here, it was worth it. Here’s to OG, who will forever live in the hearts of musical fans and myself. Running Time: 1 hr., 34 mins. The first note to mention about Catfish is to understand that it is not a thriller or suspense documentary. It is a smart marketing move to attract viewers yet will disappoint those seeking a mockumentary in the vein of the Blair Witch Project. The second note is that the latter half of the movie is not as surprising or out-of-the-ordinary to shock viewers. Again, it is another exaggeration to garner an audience. So what is Catfish? Catfish is (what this reviewer truly believes) is an honest documentary about the clash and struggle of digital identity in the 21st century and the emotional turbulence of it all. It is not a revelatory documentary that creates an original perspective or niche but is a telling piece that will most likely fall into the annals of history of this time period to reveal that behind the digital mask is a flood of emotions that are genuine and real. Catfish follows Nev, a 24-year-old photographer, who starts to receive paintings from a young girl who is a fan of his work. She, Abby, is an 8-year-old girl who saw a picture she really enjoyed from a newspaper and recreated it for him via a painting. Nev slowly starts to engage with the girl and starts to get to know her entire family via Facebook. Eventually, he starts to become casually and romantically involved with Abby’s half-sister, Megan, online. After a period of time with each other over the phone and Facebook, his brother and friend coax him to go on a road trip and meet Megan and the rest of the family. What they discover is not what they expected to find. Catfish’s weakest points come out in trying to build up a narrative that is primarily played out online. The first half of Catfish is a very one-sided affair; most shots consist of Nev and his interactions over the phone and being online on Facebook. This becomes crucial to understanding the emotional trappings of Nev and the people he speaks with, yet the filmmakers have difficulty in keeping with the brisk tempo of the film as these scenes start to drag on a bit rather than constantly bring new insights into the relationship or twists that come a bit too late for the impact to be just right on audiences. Perhaps cutting some scenes out from this section or editing a few minutes out of certain exchanges may have assisted here. This meandering problem does bleed into the other parts of the film as well such as near the final act. 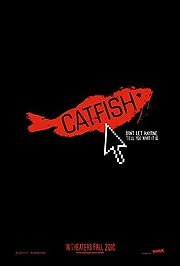 Additionally, as a documentary, Catfish has a bit of difficulty in discovering its message and overall thematic tone. This can be attributed to how the narrative morphs yet the sudden shift near the end makes the text feel more imbalanced…as if the filmmakers themselves still did not know how to treat the final film they had before them. A weakness? A truth? That will be up to the audience to decide in the end. But there are some smart technological inclusions and modern flair that helps make this a timely film as well as an emotional one. It may seem silly to use Google products in a feature film, yet here, these inclusions work with the digital theme. When Google Earth is used for instance, in the opening scenes, there may be a few chuckles, yet it automatically sets the tone of the film and this is not abused to the point of overexposure. Other modern touches such as Facebook and the research done via online is a testament to how in tune and relevant the documentary is and really speaks and connects with like-minded audiences while being revelatory to those unfamiliar with these advancements. And then there is the crucial crux of the film: Nev. At first, the characteristics of Nev feels a bit forced onto the audience which brings up initial suspicions of this being a mockumentary, yet slowly, he becomes a more and more compelling and empathetic character. Even though he accepts this position of being a specimen for his brother, the audience watches as he starts to develop an attachment and exude a bevy of other levels of emotion that connects with the audience. Even with the mixed message ending, Nev’s character is what keeps the audience understanding of the power that even the digital life can bring unto us. Catfish is a 21st century drama disguised as a documentary. It may feel like, to some, a mockumentary. Other may feel that the impact of the final act is not as effective the filmmakers wanted. Perhaps that has to do with the fact that this film is at times harder to grasp or feeling off with a camera shot and exposition. However, it is a surprisingly personal tale that weaves the audience in with very close-up shots and current-day technology. The end moral will be up to the viewer to decide, yet perhaps that is why it is beautiful to call it a documentary, as biased as the film turns out to be. Some audiences will scoff; others will feel hurt; and some may be puzzled, yet Catfish is a fairly accurate representation of the 21st century digital world: one that is filled with puzzles, strife, and love all mixed into the vast reaches of the web.